So Cinema screen probably is one of the major factors of a great cinema watching experience. 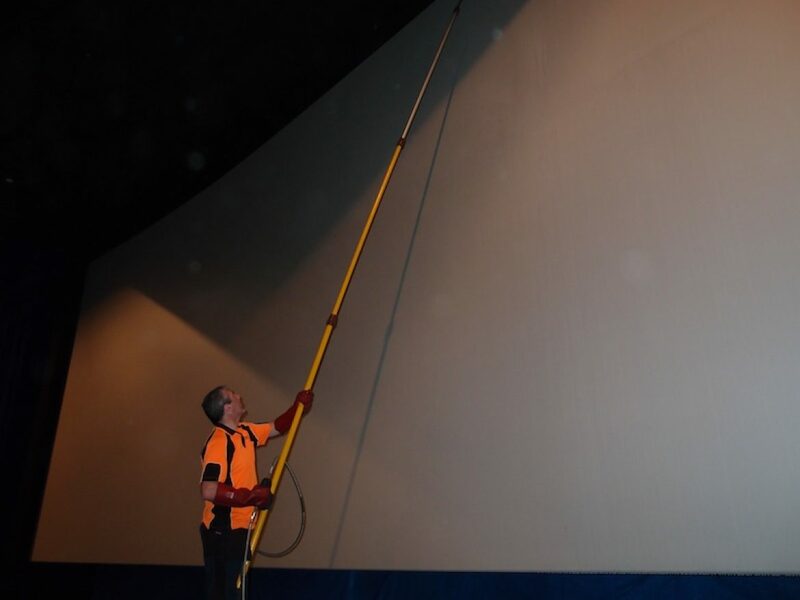 This being said, let us tell you more why and how should you clean your cinema screens. How clean are your cinema screens? After years of use, your cinema display screens can become dirty and dull – resulting in a less-than-optimal viewing experience for your paying customers. Your screens should be cleaned regularly to avoid the build-up of dust, contaminants, and stains over time, which can compromise the optical characteristics of your screen and diminish its brightness by up to 50%. Regular cleaning is proven to make a difference in both screen longevity and image quality. After a thorough clean, matte and pearl screens typically measure a 10 to 30% increase in both luminance and gain, which improve brightness. But be careful how you clean your movie screens. Certain chemicals and detergents may damage the surface coating, or leave a streaky finish. A word of warning: the surface coatings on silver screens are too delicate for cleaning – only clean matte white and pearl cinema screens, and always work with a professional. Peter Jackson Debuts “The Hobbit” at 48 Frames-Per-Second →← Will 4D Technology be the Next Big Thing in Cinema?